With Jen leaving town in a few days I set a goal of getting rid of as much vegetables as possible tonight and tomorrow. 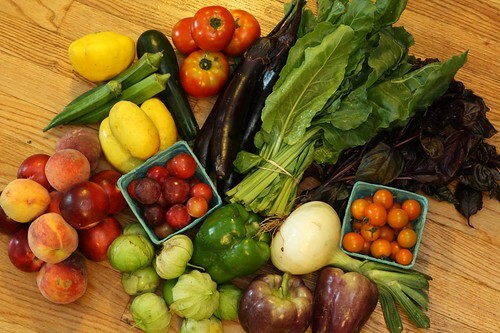 I find the proposition of a fridge full of vegetables for just be to be extremely stressful. And let's face it, I don't need any stress while Jen is away. Stress doesn't blend well with Belgian Strong Ale. Week #8's share included the following: one pound of summer squash (a thankful reprieve), 1 bunch of spinach, three lemon cucumbers, one Wala Wala onion, one pound of tomatillos, three more okra, one basket of Sin Gold cherry tomatoes, one pound of slicing tomatoes, one bunch of opal basil, two lilac peppers, one green bell pepper, three orient eggplant, one bag of peaches and nectarines, and a basket of sugar plums. 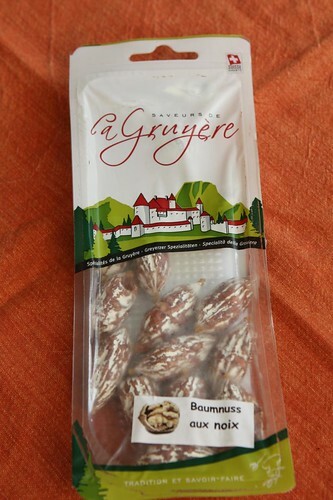 I noticed that one of the souvenirs we'd acquired on our recent visit to Gruyère was about to expire. In fact it had expired yesterday so it was a good idea to serve it up soon. I'd hoped to reserve this for a future Swiss-themed meal in celebration of the trip but that was not to be. These were little salamis stuffed with walnuts. I bought them because they were kind of wacky looking even though they're apparently fairly standard in Switzerland. 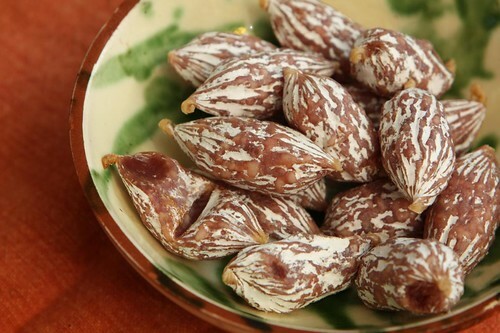 They're either called baumnuss aux noix or perles de salami noix. It's difficult to say based on the packaging. They actually ended up being even better than I'd imagined. They had an intense, almost creamy walnut taste to them. They ended up being a very nice before dinner snack. I've been laying off of buying salad greens recently so this took the place of a salad. Nutritionally it's about the same, I'm sure. I don't have any research to back that up but I can just feel it in my gut. For a first course I took last week's okra with this week's okra and made beer battered okra with a sweet chili mayonnaise. I made a beer batter using flour, cornmeal, whole grain mustard, yellow mustard, and a can of lager. Then I chopped up the okra, tossed it with a little salt and pepper, dipped it in the batter, and fried it. These were delicious. Sort of. The problem was that some of the okra was nice and some of it was extremely woody. The result was that selecting the right piece of okra to eat was much like navigating a minefield. Sometimes you would get a cruncy exterior with a soft interior highlighted by the dipping sauce. Other times it would be a crunchy exterior that seemed to be filled with grass and twigs. 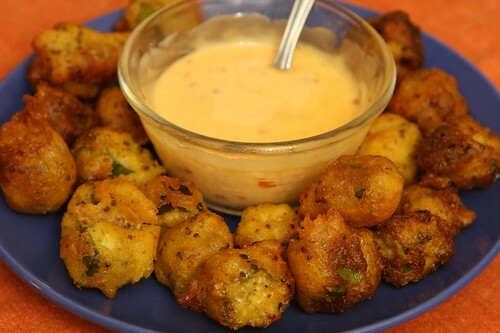 After some time I found myself peeling off the batter away from the okra and just dipping that in the sauce. What are vegetables anyway if not merely a vessel for a fried exterior? For the main I opted to get rid of the zucchini right away so I could go into the rest of the week with a clear head. I turned last night's dinner into a makeshift risotto by sauteeing up a little fennel, zucchini, and tomato then adding the green onion pesto rice and smoked salmon. 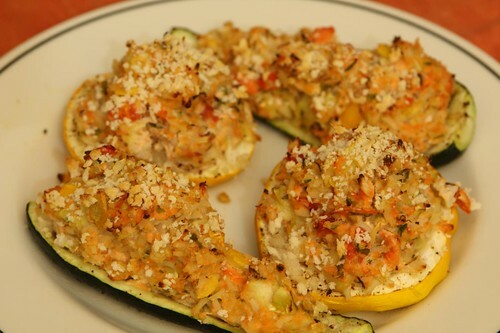 I also threw in a touch of ricotta at the end before stuffing the zucchini and roasting it in the oven with a little panko on top. I'm not a master of pairing beer with food. In fact I'm quite bad at it. There are a number of reasons I'm not good at it, the most outstanding one being that I don't really believe in it. 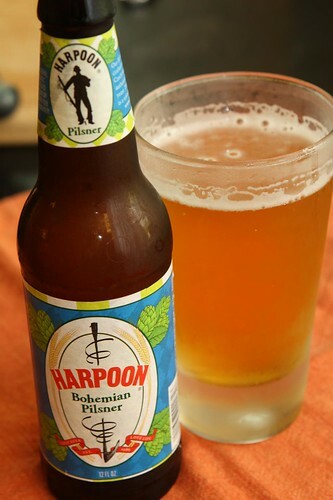 That being said, this Bohemian Pilsner from Harpoon Brewery was a lovely accompaniment to some summer squash. I think it was clean and crisp and not just because that's what it said on the label. For dessert we had Jen's peach and ginger Popsicle, the second in a three part series. Jen has been like a mad scientist lately cooking up these concoctions on a nightly basis. 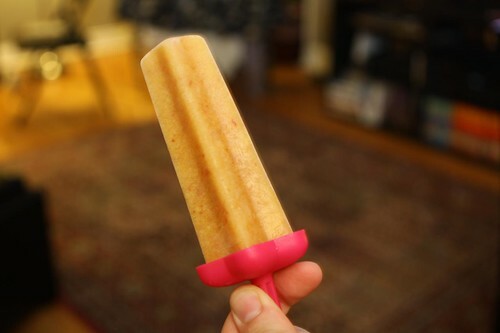 This Popsicle was better looking than the Aperol grapefruit Popsicles but we both agreed the latter was tastier. There is a third Popsicle to be sampled tomorrow. Will it unseat either in terms of appearance or taste or will it take a back seat to the Aperol grapefruit. You'll have to tune in tomorrow to find out. Unless we decide to have something else as dessert. Labels: beer, Dessert, How'd we use it?, Leftovers, What'd we get?